If there’s any filmmaker more controversial than Darren Aronofsky, I’m not sure who it would be at this point. Interestingly enough, while most of his films are rated “R” (or higher, like the uncut Requiem for a Dream (2000)), I think Noah (2014) is the first time one of his films has been at the PG-13 rating. 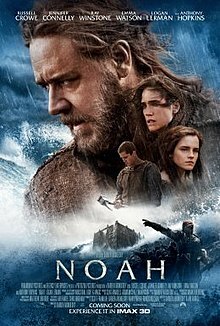 Since most of the controversy of his movies comes via the content that would make it R-rated, it’s interesting that the controversy with Noah is more along the lines of how Aronofsky filled in the gaps and created a dramatic narrative inside the Biblical story of Noah. As is always the case with an Aronofsky film, Noah is a beautiful spectacle of filmmaking. Even if the landscapes of Iceland helped create this stunning setting, certain dream-like sequences and moments speak to the art that Aronofsky can evoke on the screen. The setting of the pre-flood world is believable, and most of the costumes and characters make sense, with the exception being the CGI-fueled “fallen angels.” Because the film is distinctly in the visual style of Aronofsky, there were a few “artistic liberties” taken with the story to create this contrast of good vs. evil. I do find it interesting how a short story that comprises a small section of Genesis in the Bible was able to be filled out to a movie that’s over 2-hours long. What helps piece together this narrative is the context of the Biblical story before this event. Drawing conclusions from what we know about the lineage as well as a number of Biblical specifics, the plot seems mostly plausible. That being said, there are a few facets to the story that contrasts with what the Bible says. Still, if it gets people to pick up a Bible and start reading, all the better. A somewhat plausible plot with stunning visuals, I give Noah 4.0 stars out of 5.